Cut out the largest sides of the cereal boxes. Draw the numbers on the back of the cereal box cardboard, one number for each piece of cardboard. Cut pieces of aluminum foil into 4 inch squares. 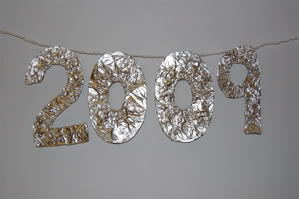 Have your child wrap the foil pieces around each number. Using a hole puncher, punch two holes in the top of each number and thread yarn through the holes to hang on a wall.